Construction Waste: What A Waste! 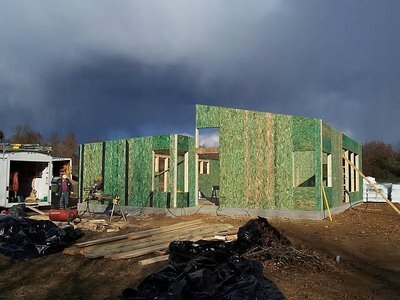 I could not help but recall our own prefab house kit construction when I read in the paper that a local landfill wants to quadruple the amount of construction debris it receives. Here's an idea: Instead of increasing landfills to accept more waste, how about if we get the construction industry to WASTE LESS? "The landfill can currently accept a maximum of 900 tons of waste per day. The proposed modifications would allow up to 3,500 tons of waste per day and increase the capacity by about 25 percent to 2.6 million cubic yards." 2. re-purposing and reusing materials instead of just demolishing? I called the modern prefab house architect David Day to have him weigh in. "In new construction, you can recycle leftover drywall, concrete, etcetera; there are a lot ways to recycle materials instead of putting it into a landfill. Better yet, don't buy and cut unnecessary materials. There are standard material sizes. If you work within those dimensions, there is no need to cut or waste material. If there IS waste, often it can be reused on the same site or repurposed for something else. 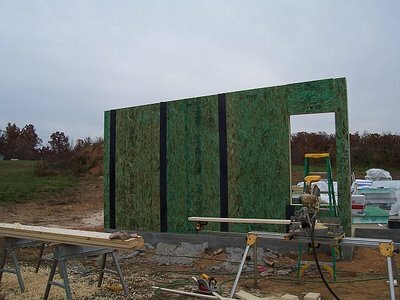 There's a whole section in LEED standards about reduction of construction waste. Copeland's husband mentioned to me the door landings on their prefab house kit were built from the small pile of leftover wood that they reused for the prefab modern house! Even that pile of wood could have fit into the trunk of their car if they wanted to repurpose it elsewhere. Do we need to tear down buildings to begin with? How often can we rehab and reuse buildings? Think of Habitat for Humanity's Restore Richmond or Caravati's - often there is someone looking for that exact material you want to throw away! From a builders standpoint, it's a money-saving, good business decision." It's not just construction waste. In the U.K. (I can only imagine what it is in the States) more than £12 billion in food waste goes in the garbage every year. I think everyone needs to rethink waste. I finally found pictures of the Hocking College Energy Institute which is about 40 miles from me on Jetson Green, and I was amazed. Check out this brand new LEED platinum training center for alternative energy and tell me if you see what I see - a giant casa-ti!!! That is hilarious! You are so right!!!! As long as you reference via a link to our site, you are welcome to reference us.